The following operations can be performed simply by carrying the electronic key on your person, for example in your pocket. The driver should always carry the electronic key. 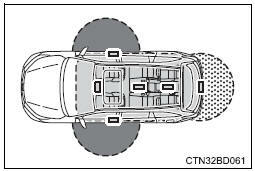 The system can be operated when the electronic key is inside the vehicle. This system can be operated when the electronic key is within about 2.3 Ft. (0.7 M) of the back door opener switch. An alarm sounds and warning messages are displayed on the multi-information display are used to protect against unexpected accidents or theft of the vehicle resulting from erroneous operation. When a warning message is displayed, take appropriate measures based on the displayed message. Exterior alarm sounds once for 5 seconds The glass hatch was closed while the electronic key was still inside the vehicle and all the doors were locked. Retrieve the electronic key from the vehicle and close the glass hatch. An attempt was made to lock the vehicle while a door was open. Close all of the doors and lock the doors again. Interior alarm sounds continuously The engine switch was turned to accessory mode while the driver�s door was open (or the driver�s door was opened while the engine switch was in accessory mode). Turn the engine switch off and close the driver�s door. In the following situations, the smart key system may take some time to unlock the doors. The electronic key has been left in an area of approximately 6 ft. (2 M) of the outside of the vehicle for 10 minutes or longer. The smart key system has not been used for 5 days or longer. If the smart key system has not been used for 14 days or longer, the doors cannot be unlocked at any doors except the driver's door. In this case, take hold of the driver's door handle, or use the wireless remote control or the mechanical key, to unlock the doors. electronic key indicator flashes 4 times. The electronic key is too close to the window or outside door handle, near the ground, or in a high place when the doors are locked or unlocked. 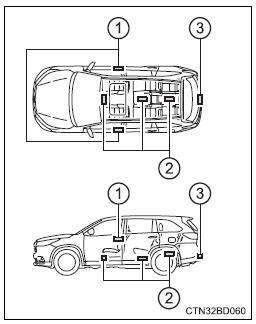 The electronic key is near the ground or in a high place, or too close to the rear bumper center when the back door is opened. The electronic key is on the instrument panel or floor, or in the auxiliary box of the driver's side instrument panel, door pockets or glove box when the engine is started or engine switch modes are changed. Do not leave the electronic key on top of the instrument panel or near the door pockets when exiting the vehicle. Depending on the radio wave reception conditions, it may be detected by the antenna outside the cabin and the door will become lockable from the outside, possibly trapping the electronic key inside the vehicle. As long as the electronic key is within the effective range, the doors may be locked or unlocked by anyone. However, only the doors detecting the electronic key can be used to unlock the vehicle. Even if the electronic key is not inside the vehicle, it may be possible to start the engine if the electronic key is near the window. Touching the door lock or unlock sensor while wearing gloves may prevent lock or unlock operation. Remove the gloves and touch the lock or unlock sensor again. When the lock operation is performed using the lock sensor, recognition signals will be shown up to two consecutive times. After this, no recognition signals will be given. If the electronic key is inside the vehicle and a door handle becomes wet during a car wash, a message may be shown on the multi-information display and a buzzer will sound outside the vehicle. To turn off the alarm, lock all the doors. The lock sensor may not work properly if it comes into contact with ice, snow, mud, etc. Clean the lock sensor and attempt to operate it again, or use the lock sensor on the lower part of the door handle. A sudden handle operation or a handle operation immediately after entering the effective range may prevent the doors from being unlocked. Touch the door unlock sensor and check that the doors are unlocked before pulling the door handle again. Unlocking the vehicle may take more time if another electronic key is within the effective range. The smart key system can be deactivated in advance. Make sure to carry the electronic key when operating the system. Do not get the electronic key too close to the vehicle when operating the system from the outside of the vehicle. locking and unlocking the doors: use the mechanical key. Settings (e. G. Smart key system) can be changed. locking and unlocking the doors: use the wireless remote control or mechanical key. : changes or modifications not expressly approved by the party responsible for compliance could void the user's authority to operate the equipment. : this device complies with industry canada licence-exempt rss standard(s). Fcc id: ni4tmlf12-1 fcc id: ni4tmlf12-2 this device complies with part 15 of the fcc rules. Operation is subject to the following two conditions: (1) this device may not cause harmful interference, and (2) this device must accept any interference received, including interference that may cause undesired operation. ´people with implantable cardiac pacemakers, cardiac resynchronization therapy-pacemakers or implantable cardioverter defibrillators should keep away from the smart key system antennas. The radio waves may affect the operation of such devices. If necessary, the entry function can be disabled. Ask your toyota dealer for details, such as the frequency of radio waves and timing of the emitted radio waves. Users of any electrical medical device other than implantable cardiac pacemakers, cardiac resynchronization therapy-pacemakers or implantable cardioverter defibrillators should consult the manufacturer of the device for information about its operation under the influence of radio waves. Ask your toyota dealer for details on disabling the entry function.